It happens that you need to install a .deb package for which certain version of a dependency is absent in the standard repositories. For example, the libcurl3 package is a dependency, but only libcurl4 is available on the system; or libssl1.0.0 dependency is required, but the system has only libssl1.0.2. By itself, such a .deb package is usually taken not from the standard repository, so it is no hope that the problem will be fixed in the future. At the same time, it is highly likely that the .deb package of interest to us will work well with libcurl4 instead of libcurl3 (it may even work better) and with libssl1.0.2 instead of libssl1.0.0 - and so on, by analogy, you may have your own dependencies, which cause problems. But you should not do what is shown here with the drivers, especially with the drivers for the video card - the probability of getting a system that loads into a black screen is too great. And with any application programs it is quite possible to try it – if all in all it would not work, we just uninstall it, it will not be worse. 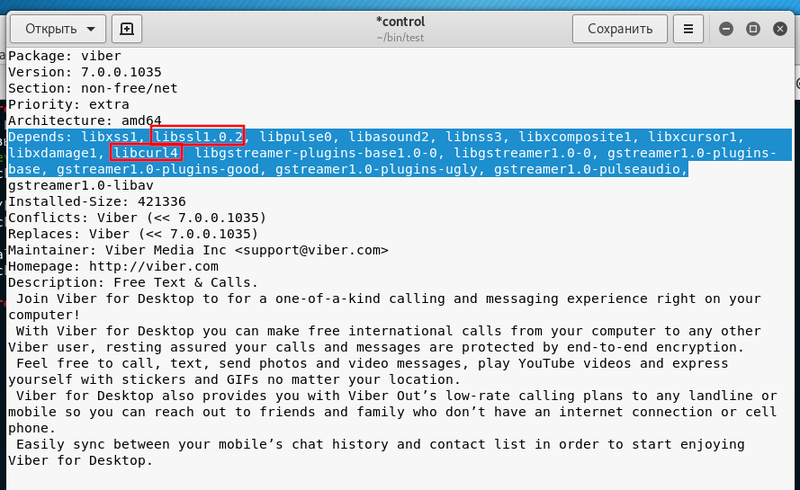 I will show how to correct the list of dependencies in the .deb package using the example of Viber, at the same time we will get a little familiar with the structure of the .deb package. 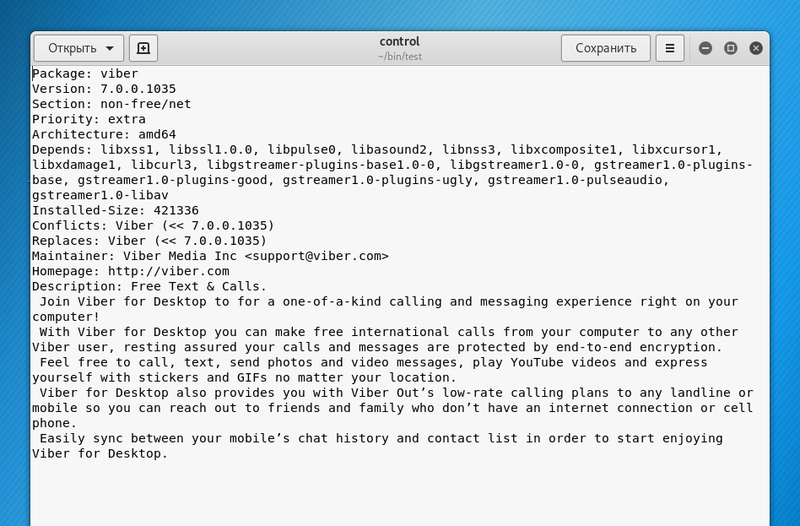 Not that Viber is my favorite instant messenger for communication - just installing it is a classic example of what I said at the very beginning: hard-coded dependencies of certain versions, but the program works fine with newer versions. Therefore, it is better to go the other way. To say simple, .deb file is an archive that contains program files (executable files, configuration files — everything needed to run the program), as well as service files, which contain a description of the package, required dependencies and other meta-information. For unpacking, we use the ar utility, which is designed to create, modify, and extract from archives. In general, since data.tar.xz contains the program itself, it may be an idea to simply scatter files in the system along the desired paths - this will also work, but we will select it a little more difficult, but more correct way. That is, this is the list of dependencies. Most likely, you've tried to install your .deb installation file and already know what dependencies are missing. Package libcurl3 is not available, but is referred to by another package. Package libssl1.0.0 is not available, but is referred to by another package. So, libcurl3 is required, but only libcurl4 is in the system. I am simply changing the libcurl3 entry to libcurl4 in the control file. Another missing package is libssl1.0.0. Since a specific version is specified, it can be assumed that the version in the repository has been updated and for this reason it is impossible to find what we need. As you can see, two options were found: libssl1.0.2 and libssl1.1. In my opinion, libssl1.0.2 is closer to libssl1.0.0, so I change the libssl1.0.0 record to libssl1.0.2 in the control file. Now we build the installation file - we do it in reverse order. This means that there is the last blank line in the control file, so delete this blank line and rebuild the installation file. Did you like to gut .deb packages? Then see ‘8.4. APT Package Reference: Digging Deeper into the Debian Package System’.